There aren’t that many pure sport utility vehicles left in the automotive market, but those that remain are the best at what they do. They might not be as fuel efficient as their younger crossover siblings, but they’re often much more capable and just as stylish. The 2018 Toyota Sequoia in Edmonton AB is a great example of this, and we’re proud to offer it right here at Toyota on the Trail. The Sequoia has been a staple of the Toyota lineup since the turn of the century, and this year it saw its first true refresh since the second generation began in 2008. It’s more stylish than ever before thanks to new exterior changes, and of course it’s now available in its very first Toyota Racing Development model, which we’ve already covered here on our website. We want to focus on the standard Sequoia SUV today, so we’ll dive into some of the specs & features that make it such a great option in the full-size SUV segment. We’ll start by once again diving into what’s new in the 2018 Sequoia, starting with its exterior improvements. LED headlights, daytime running lights, and fog lights are now standard, and the front fascia was redesigned to present a more sophisticated front end. Furthermore, each trim level has its own, unique grille. Finally, there are three new exterior colors that give shoppers even more options to choose from. 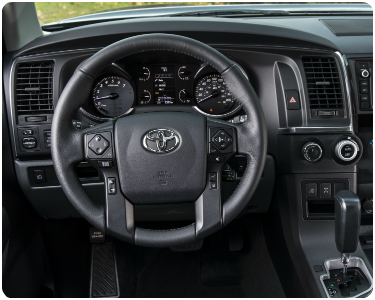 On the inside, the instrument cluster was redesigned to be more driver-centric, and both automotive emergency braking and the Toyota Safety Sense P package now come standard. Now that we’ve covered all of that, we just want to touch quickly on the Sequoia capabilities, as it sometimes acts more like a pickup truck than an SUV. With 381 horsepower and 401 pound-feet of torque, the Sequoia is capable of towing up to 7,100 lbs. of weight behind it when equipped with the towing package. All of this is just scratching the surface of the 2018 Toyota Sequoia, so give us a call if you think you might be interested or would like to learn more.